Bill Mollema has a lifelong obsession with pipe organs. He lives every day with this passion; it infuses every part of his life, every waking and sleeping moment. He is surrounded by his art. Even his home is a testament to it. No, really. 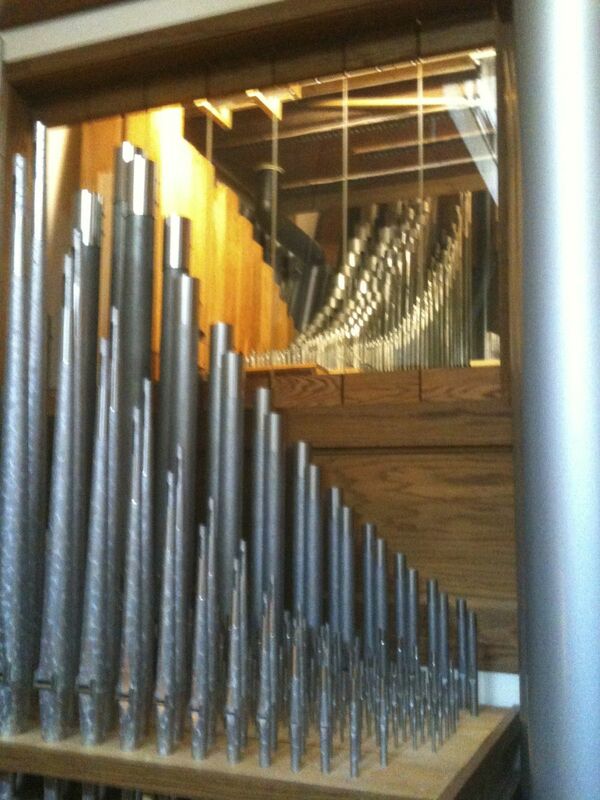 Bill loves pipe organs so much he built one. And lives in it. Bill is a close friend to my cousin's family in Kalamazoo, and during a recent visit he gave me the grand tour and a brief concert. At theaterorgans.com, Bill tells his story. "In 1976 I installed a new instrument in a church which had a very unusual design. The building was basically a cross of two symmetrical, flat topped A frames; and I was struck by the plan and felt that a down-sized version of this design would make a really neat home. More importantly, it would be a house that would lend itself to a pipe organ installation. I immediately set out to design my dream home and in the early summer of 1976 began construction after acquiring 20 acres of property in the country on which to build." These are the pipes that would play during a fanfare (bugle and horn sounds), which protrude from the fireplace surround. Now both the house and the organ are complete. (Well, there's always something else to be done, as with any house and, I would imagine, any gigantic pipe organ.) Organ enthusiasts regularly visit his home, Scotts Fox, and Bill hosts house concerts. A bridge connecting the two sides of the second floor floats above the living room. This is the room where concerts are held, and where the organ console is played. It is bookended by the fanfare fireplace on one end, and on the other, multiple levels of pipes in all sizes. The organist can accentuate or muffle the sound as he is playing by using a foot pedal to open or close baffles in front of of a particular group of pipes. Commonly these baffles are made of wood or some other solid material, often padded or upholstered. Some of Bill's pipes are baffled in this way, but for most of the baffles, Bill used glass. That way, the pipes are always on view. In the top half of the photo above, you can see a few of these glass slats, which louver open and closed at the touch of different foot pedals. The pipes in Scotts Fox were collected over decades from churches and old theaters, as he says, "through a fortunate combination of happenstance and luck." Bill is interested in both church organs and old-fashioned theater-style organs, and built an instrument that combines pipes and a console from both. Drawing again from his own (somewhat technical) words at theaterorgans.com: "By the time a specification had been conceived and put down on paper, I realized that I would never find a console of sufficient size with which to control this organ. As a result of this realization, I designed and built my own 4 manual console in my workshop. It was my desire that the console be 'user friendly' - a console at which both theatre style organists and classic oriented organists could easily feel at home. Although the console is constructed in the theatre style, it can still easily be managed by the classical musician since those stops are grouped together in a standard arrangement rather than being mixed in with the theatre voices. Aside from sharing keyboards and couplers, the arrangement is really like two consoles in one." Almost as jaw-dropping as the living room/concert hall above was the belly of the beast, in the basement below. Thousands and thousands of circuits run the organ, and once again, Bill built them all from scratch. The wires are meticulously color-coded, tied, and labeled. A separate power supply runs the organ, and all of the mechanics and cooling fans are housed in a sound-insulated room underneath the pipes. Every theater organ needs a good alarm bell! The instrument is effectively finished, much to the surprise of his friends, who feared the project would drag on forever. That said, Bill will probably always be adding this or that novelty sound as he finds it: fire alarm bell, telephone bell, old-fashioned "aaawOOOOOgah" car horn. He writes, "Now that I have retired from the business of organ selling, installing, and maintenance; I have once again become a hobbyist and finally have the time to put the finishing touches on this project." Not to mention tending the garden, the pond and the pool, and rolling through the green Michigan countryside on his Harley. Bill Mollema may live in a pipe organ, but he plays more than just one tune.